Quadcross Team Ireland who finished second to the USA in Denmark at the weekend. Quadcross Team Ireland finished a sensational second overall behind team USA at the 2018 quadcross of Nations at a very difficult and demanding track at Slageise, Denmark at the weekend. With 15 teams competing from all over Europe, Leon Rogers, Mark McLernon and Justin Reid of team Ireland left it until the last race before claiming their history making result. Gary Moulds and Steve Kirwin (23) battle with Brett Wilkinson and Dan Chamberland (11) and Willy Bouqet and Pavel Boukal (5) at the Sidecarcross of Nations in Denmark. In their opening race of the day Justin Reid and Mark McLernon made average starts getting boxed in on the opening lap at the same corner but they worked their way up through to sixth and ninth respectively by the chequered flag. Race two was better for McLernon as he challenged for the top three against the dominant Americans only for a bearing to collapse on his Yamaha that blew any chance of a top three finish leaving him to limp across the finish line in 27th. Leon Rogers had his own problems struggling with bike set up on his WSP KTM 450 to finish fifteenth. Going in to the third and final race Team Ireland were down in sixth place but in all sports you need that little bit of luck on you side and on the day the luck of the Irish was on their side. And although Rogers and Reid got caught in other peoples crashes the Netherlands had a rider leading the race when his machine stopped which let Ireland onto the podium, to finish with second overall behind the USA and just in front of a heartbroken Dutch team. The sidecarcross team, were on course for a top six finish when ten times world champion Daniel Willemsen barged team Ireland’s Gary Moulds and Steve Kirwin out of a possible seventh place finish in race three. Ulster and Irish Champion Moulds with passenger Kirwin qualified fourth and in his opening race was twelfth into turn one before pushing hard to get into eight place before getting stuck in one of the deep ruts on the track. As Kirwin was lifting the outfit out of the rut a Latvian crew piled into them badly damaging Kirwin’s right hand. By the flag they had to settle for a disappointing fifteenth. The Ingram brothers took it steady and brought their outfit home in 19th. Race two saw Moulds finish eighth with Neil Campbell and Craig Parmenter back in fifteenth. Now the team were on course for a sixth place overall, with only one race to go. Unfortunately Campbell and Parmenter ended up 17th in the final race with the Ingram’s crossing the line in 21st. It was a case of what might have been for Ireland but in the end they finished eighth behind overall winners the Netherlands. “It was a great weekend but I suppose a bit disappointing in the end that we didn’t finish higher than eighth,” said Moulds. “We believed that the track with all the deep ruts would suit our outfits but as it turned out it was the opposite and we had all sorts of problems. 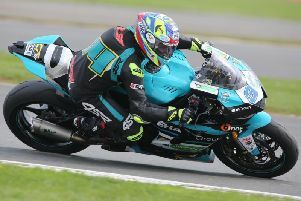 “After such a good qualifying race one was disappointing as we finished fifteenth after running eighth and with Steve getting injured it meant that he rode our second race one handed as his right hand was so badly swollen. Still we finished eighth. Moulds will now focus his attention on the British Championship at Canada Heights were he currently lies in second place.